It seems like every day someone comes up with a new use for FLIC Luminaries. We've listed some of the main areas where our business is focused and growing, but if you do not see the area where you envision using them, please let us know and perhaps we will add it to what we have listed here. Our growth will largely come from you, the customer and visionary, who will continue to create new uses for our extremely diverse products. Please contact us with your ideas! FLIC Luminaries started with the goal to create decorative luminaries for the holidays, especially Christmas. From there it has grown into wider use, including other holidays. Our luminaries offer you classic, tasteful holiday lighting that stands apart from other holiday lighting choices. We have luminary colors to meet your holiday needs. We've got white, brown, red and green luminaries for Christmas, green luminaries for Saint Patrick's Day, decorated orange and orange luminaries for Halloween. And now we offer multi-color luminary sets in your favorite holiday colors, like red-white-blue luminaries for Independence Day (and all patriotic events), and red-green luminaries for Christmas. We hope to offer a special blend of summer colors soon for your special, festive summer parties. Luminaries for business use are popular and a growing segment in our client base. Typically, uses are for an event or holiday. Luminaries can help promote events by drawing attention to what is going on. Auto dealerships, hotels, shopping centers are frequent clients for us. 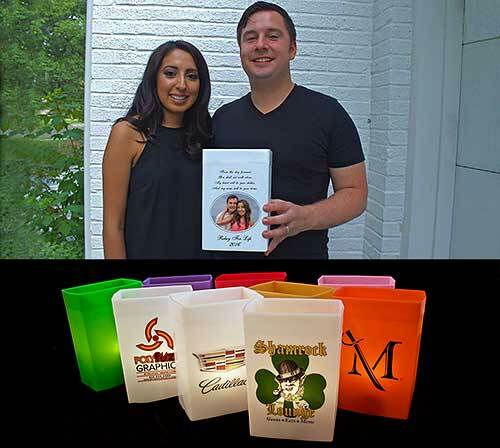 We offer 4-color printing on luminaries as well as an assortment of luminary colors and lighting options to customize our luminaries to fit the desires of our clients. 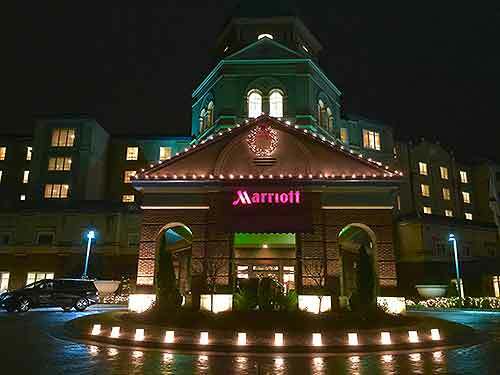 Shopping centers add luminaries to their roof lines to help give the Christmas spirit to shoppers. Municipalities and local business districts add luminaries to help promote their holiday themes while spreading warm, cozy light. Hotels, restaurants and just about every business gain a huge benefit by bringing luminary joy to others. FLIC Luminaries now offers 4-color printed luminaries! Luminaries can be printed on the front or can be printed on all sides, creating a full-wrap effect. These printed luminaries can be used outdoors or indoors. Indoor luminaries are often generated into a "kit" which includes a single-socket light string with on/off switch and/or a LED tea light to stay cordless. Since printed luminaries are often made for use at an event or ceremony, it is common to use a LED tea light to show them lit at the event, and then the recipient of the luminary also receives the rest of the kit (light string) to take home for their keepsake item. There are many great uses for printed luminaries. Often they are used for fundraising events, memorial events, motivational events, promotional and advertising purposes, too. It is possible to print large quantities of the same print design or one-off (print on demand) luminaries. Contact us with your questions and ideas. We will do our best to help you create your vision! Many Homeowner Associations have discovered FLIC Luminaries over the years. 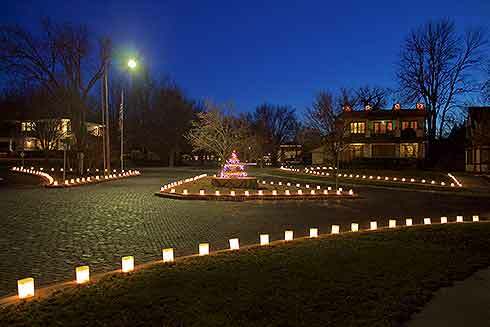 Organized neighborhoods often desire to celebrate the holidays with luminaries all through their neighborhoods, and the experience is phenomenal! Homeowner Associations who organize their purchases together qualify for special wholesale pricing. We have built an infrastructure to accommodate neighborhood organizations so they can develop a voluntary holiday lighting program that raises funds for lighting their common areas while keeping members happy with the ability to buy luminaries for their own homes at discounted prices. Contact us through our website, or by phone or email and we will be happy to work with you on decorative lighting for your neighborhood this holiday season. FLIC Luminaries are used for all kinds of special events, from corporate events to fundraising events from major non-profit organizations to small groups. Luminaries are also a great enhancement to simple company parties and recognition events. Special events may be a one-time event, but our luminaries are built to last and will come in handy for future events, too. Just store the luminaries in their original shipping boxes and they will be ready to use again for the next big event. Luminaries can be decorated to change their appearance for different themes. The one common aspect of all events is the need for decorative lighting, and our luminaries will fit any situation and are only limited by your ability to create. Our luminaries help draw a lot of attention when used for promotional purposes, like sales promotions by car dealerships to neighbors having a garage sale. People passing by can't help but take notice! 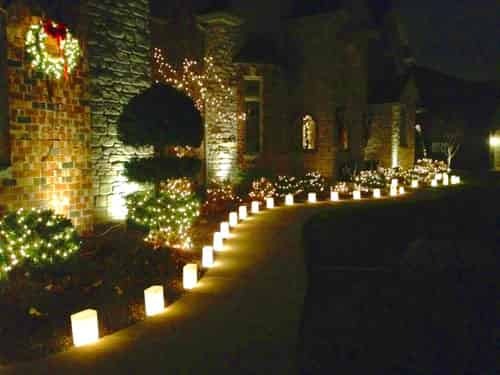 Use our luminaries on the ground, or mount them up high, on top of buildings, in trees, or even on top of your pergola! FLIC can custom-build light strings up to 1000' on a single plug-in with use of our new C7 LED light bulbs. 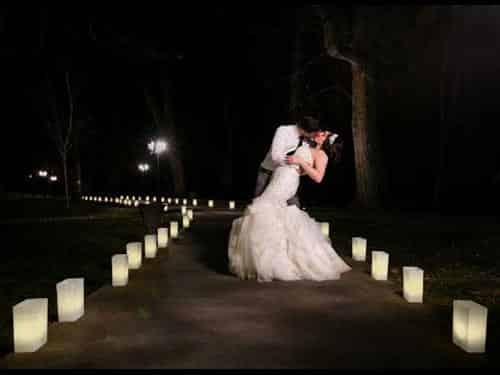 Bride and grooms increasingly desire specialized lighting for their weddings and wedding receptions. Our white wedding luminarias are a very popular choice for wedding planners. 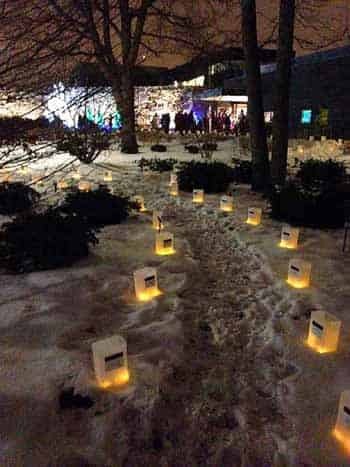 Whether the event is indoors or outdoors, our luminaries fit in any situation. Contact us for wedding event planning and free advice! Military families are embracing our luminaries for "Returning Home" deployment parties. We will soon cater to our well-deserving soldiers with our patriotic luminaries colored in red, white and blue! Our luminaries are a big hit for graduation parties. Our festive lighting will be the hit of the party, whether you throw it in your backyard or at a party venue. Birthdays are a big celebration every year, so why not use our luminary lighting as a final touch to your special decor? You can bring them back year-after-year and they will always add to the party!